Adding a "parry" like animation to blocking with a weapon. 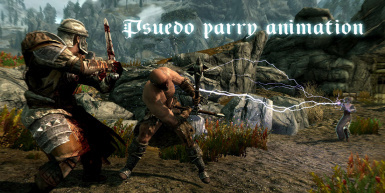 The wonderful parry sound effects are taken from the awesome "Improved Combat Sounds" mod made by judgefredd. Thanks for the permission to edit and use your sound effects. First I want to give a huge shout out to my co-modder here - Krish698. He created another variations for parrying with 1H weapons and 2H swords. He endured all my critics and comments until the animations got to where they are. thanks a lot for the willingness to help and for a great job! Also big kudos to judgefredd who created the mod "Improved combat sounds". it's just a great sound mod. And, of course, bethesda, for the awesome game. To alleviate this issue I replaced the tiny animations of "absorbing a hit with a weapon" with the bashing animation and with custom made animations made by the awesome krish698. What this means is that once you hold a weapon to block and successfully block a hit than at the moment of impact you will see a short bash or parry animation that will give the illusion that your character changed the angle of the weapon to parry the hit. This, of course, also applies to the enemies as well. There are 3 different parry moves for 1H weapons and 2H swords and 2 different parry moves for blocking with a 2H axe or hammer. The changes will apply to all human NPCs as well as the player. check out the video in the video section. Also, Since the "absorbing" animation has changed I also tweaked the parry sound effects to compensate for the lack of sync. either extract the files into the data folder or use NMM. If you are not using NMM than you will need to manually remove the files that came with the mod. To know what to remove just look inside the archive of the mod. Krish698 has improved the 2H top-heavy animations (war hammers and war axes) and made a variety of 3 different parries - overhead block, left block and right block. enjoy! Krish698 has improved the 2H swords animations and made a variety of 3 different parries. thanks again krish! you rock. Krish698 has refined the 1H animations so the looky better without glitches for the player or repeated bashing animation. Thank you, krish! various parry animations for blocking with weapons. Nothing that hurts gameplay but occasionally there are jumps in the parry animation or jerks in the legs, but these fix themselves after a second. 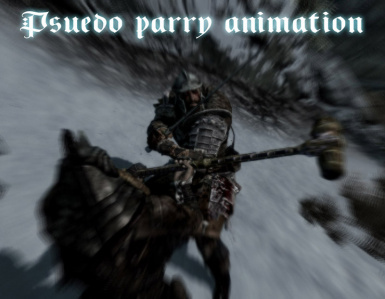 This mod changes the animation and sound files of block hit for both 1H and 2H weapons. not with a shield and not the idle pose of blocking. naturally a mod that changes these animations will not be compatible but i dont know of such a mod. Also this mod should be compatible with "duel wield parry" by borgut1337 and any other animation mod out there. If you discover a mod that isnt compatible with this mod - let me know! Also this mod changes the sound effects of the impact of weapon on weapon so any sound mod that changes combat sound effects will not be compatible if the sound mod is installed AFTER my mod. But that is easily solved - all you have to do is install Pseudo parry mod AFTER every sound mod. If you installed a combat sound mod after you have my mod installed than you will notice that blocking a hit is out of synch. just uninstall and reinstall my mod and it will be synced again. Simple melee tweaks - http://skyrim.nexusmods.com/mods/39054//? it only works in 3rd person. i have no intentions on making a 1st person version. First I want to give a huge shout out to my co-modder here - Krish698 :) He created new variations for parrying with 1H weapons and 2H swords. He endured all my critics and comments and tried to figure out what da heck i wanted from my illustrations, until the animations got to where they are. thanks a lot for the willingness to help and for a great job! Also big kudos to judgefredd who created the mod "Improved combat sounds" from which I took the sounds and edited them. it's just a great sound mod.